A collaborative story written during a creative writing workshop between the Forest Online and Wild Forest and Fauna’s Future Leaders program. Written by Jimmy, Jason, Sunshine, Elvis, and Tania. El sonido del trueno hace temblar la tierra. Su estruendo continúa por toda la selva mientras la lluvia corre entre las hojas y el lodo. La luz del relámpago corta a través del oscuro cielo y revela cada rincón y cada espacio en donde las criaturas salvajes se protegen de la lluvia. La tormenta continúa con toda su furia, señalando el comienzo de la época de lluvia. A pesar de la fuerza destructiva de la tormenta, la selva se mantiene serena, revelando el balance delicado entre el poder de la Madre Naturaleza y la fragilidad de la jungla. El ecosistema complejo de la selva necesita de este poder para calmar la insaciable sed de vida. Entre la densidad de la vegetación, gotas de lluvia ruedan cuesta abajo en el caparazón de una tortuga concentrada en sí misma. La anciana tortuga abre sus ojos lenta y curiosamente, observando todo a su alrededor, enfocándose en cada mínimo detalle. Se percató de un detalle inusual, una hoja color turquesa que caía suavemente cerca de ella. El movimiento de la caída no era como el de otras hojas, sino que parecía danzar con la brisa. Después de un momento, la delicada mariposa, disfrazada de hoja, se posó en la espalda de la tortuga, de manera delicada y majestuosa, lo cual cautivó a la tortuga. La mariposa volaba por la playa, buscando por sales y minerales esenciales para su dieta, tratando de evadir la fuerza pluvial. As a tourist, one of the things you always keep in mind is buying souvenirs for your loved ones. I am not an exception to that. While at one of the tourist attractions, El Cristo Blanco, I couldn’t resist to take a look at some of the merchandise found at the site. A group of street vendors were sitting next to the site, offering their beautifully crafted souvenirs to the tourists. I settled for one of the vendors, an old but friendly lady. This wasn’t the first time I have seen vendors of this nature taking to the streets to sell their merchandise. Since our arrival at Cusco, I have noticed a great number of vendors casually sitting on the street, selling their products to hungry tourists; a sight that is equally beautiful and depressing. I was curious to know where the merchandise originated. I asked the lady, and her response was quite surprising to me. As it turns out, most the merchandise sold by these street vendors is made by the vendors themselves. This includes bracelets, wooden flutes, and knitted goods, among many others. However, I noticed that among these items, you can also find very detailed replicas of statues that represent the culture and religion of Cusco. I asked the lady if she or her family had sculptured these items, but her answer was no. It so happens that these replicas are factory made, and the vendors buy them to resell them. The lady added that most of these factories are owned by either family members or friends of the family, rather than a multi-national corporation. Learning the source of these items made me feel more at ease with the idea of buying souvenirs from street vendors—and being a tourist. 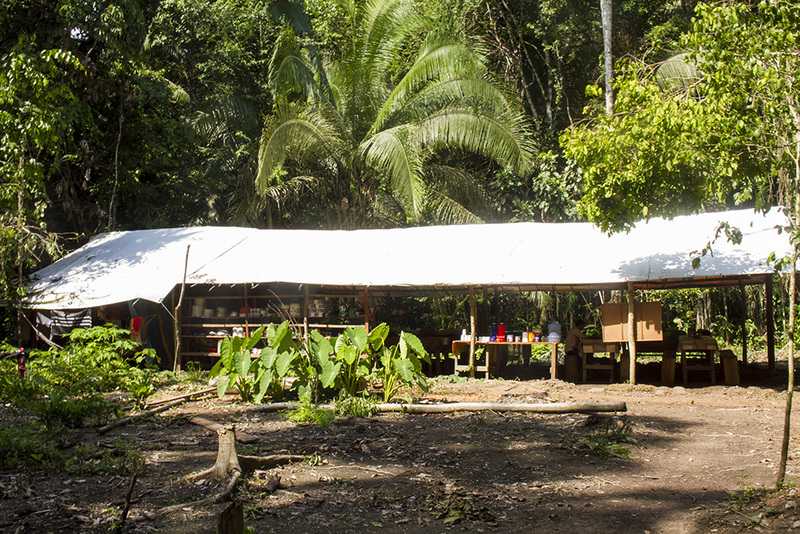 In The Forest Online, Peru-based research is considered especially honorable. In the classroom, Dani and Jimmy, who investigate aspects of Peruvian culture, are members of an elite squad known as the Community Group. These are their thoughts (on weaving). Dani: I love to knit, so I did some research on weaving in Peru, such as how it’s done and what materials they use. Jimmy: And I researched Peruvian economics to see where textiles falls into the economy. I found out that Peru’s main exports are gold and mercury. At first I imagined that these exports brought wealth to the people, but I was incorrect. In reality, gold and mercury exports are not only diminishing the economy of the country, but they are also harming its environment. 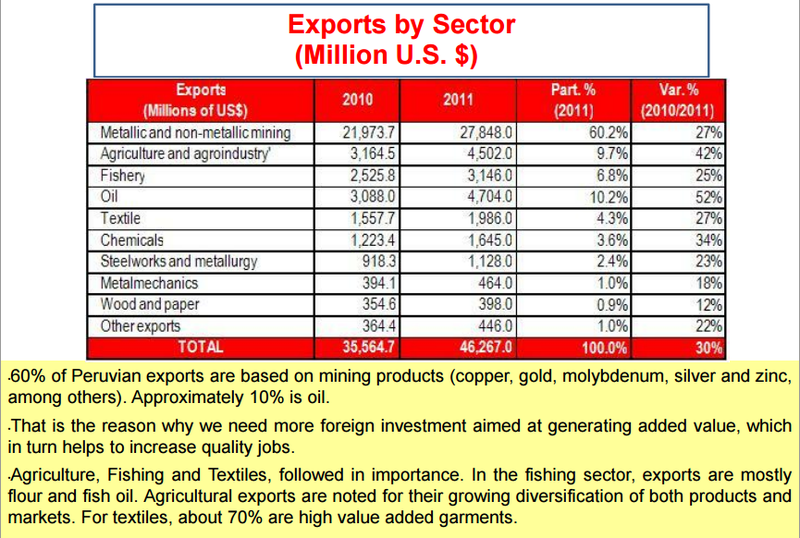 Peru’s exports by sectors (2010/2011). Image by The Cotton Forum. As preparation for our January trip to Peru, our class has been visiting a large property a few miles off campus owned by McDaniel College. Below, Jimmy, Lucy, GW, Cris, and Jason share what they found. It is the dream of many colleges and universities to be able to own a farm. Some colleges, such as Warren Wilson College and UC Santa Cruz, take advantage of the opportunities a farm can bring to its students. McDaniel College has the potential to bring similar opportunities to McDaniel. It is simply a question of funds, priorities, and the will to chance that which we can change. For Warren Wilson College, the farm is an integral part of the college’s education, acting as a way to merge college education with the “real world.” In UC Santa Cruz’s farm, the main focus is the education of the community, with agricultural programs that that assist elementary school in building their garden-based science and nutrition curricula. 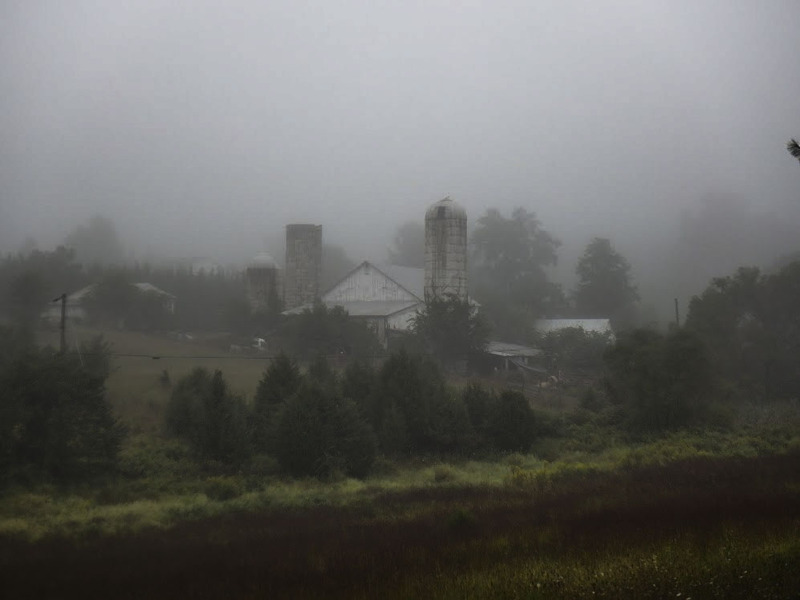 McDaniel College’s farm has the potential to be used profitably in benefit to the education of its student body as well as the college itself. Dwelling upon the history of the farm, we will explore the different ways in which the farm has been beneficial – or not – to previous owners.